The start of re-roofing and re-siding has begun on the home. The home was hit twice in May by hail and high winds, resulting in a total re-do of the exterior of the home – the roof and siding. The strips of exposed wood show where insulation is being blown into the home. About every foot, a hole was drilled and insulation was blown into the walls. In some areas, there was literally NO insulation. Needless to say, it should be warmer this winter. 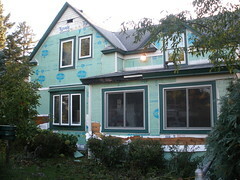 See that flimsy green insulation? Apparently it has an R value of 2 (I think that’s what it was called). See how it doesn’t cover the entire house…how it has all those large gaps between the insulation? That’s because it wasn’t properly done the first time. Now I’m beginning to understand why the propane bill has been so incredibly high for all these years. Will be nice to have the job completed. Went to the apple orchard as we do every year. 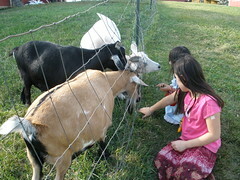 The girls love feeding the goats. Went on a nice walk on one of the trails at the orchard. Got a bunch of apples that we made into applesauce. This year I canned it all rather than freezing it. This is one of my favorite parts of homeschooling – being able to take "field trips" like this, and have the girls see and interact with animals that we don’t have at home. Their phy ed for the day was the beautiful walk on the trail. At home, they helped make the applesauce (a home ec lesson). This is on the last day of Courage Riders, a therapeutic horseback riding program that Olivia has been a part of since she was 3 1/2 years old. The person standing next to her is one of the side walkers…a volunteer who donates her time to the program. For each rider, there are 3 volunteers (two side walkers and one lead walker). Olivia is legally blind in both eyes, has speech delays, developmental delays, and Sensory Integration Dysfunction. Because of these challenges, she is able to take therapeutic horseback lessons through the Courage Center. The program has made a tremendous difference in her life. 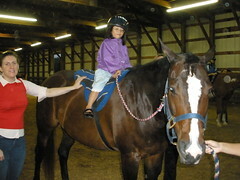 When she first began riding a few years ago, she couldn’t even sit up on the horse. She was slumped over and had very little muscle control in her trunk. She also was unable to say more than one word at a time. During the program, she put two words together for the first time. This year, I noticed that Courage Riders included more activities with speech and letter/word identification which was interesting. I continue to find it fascinating the impact that horses have on people, especially children.